Ketones are important industrial solvents used for paints, varnishes, resins, adhesives, coatings, inks, cleaning, pharmaceutical manufacturing, and polymer production. One of the chief quality parameters for ketones is water content, as water, even at very low levels, may have an adverse effect on an industrial process that calls for a ketone. In my previous blog post, I mentioned using Karl Fischer (KF) titration for the determination of water in gasoline and referred to that method as being difficult and sometimes inaccurate. A good example of where Karl Fischer can really struggle is when water is to be quantified in ketones. Ketones can form ketals in the presence of KF methanol, which leads to water as a reaction product and a high bias on quantification (Figure 1). 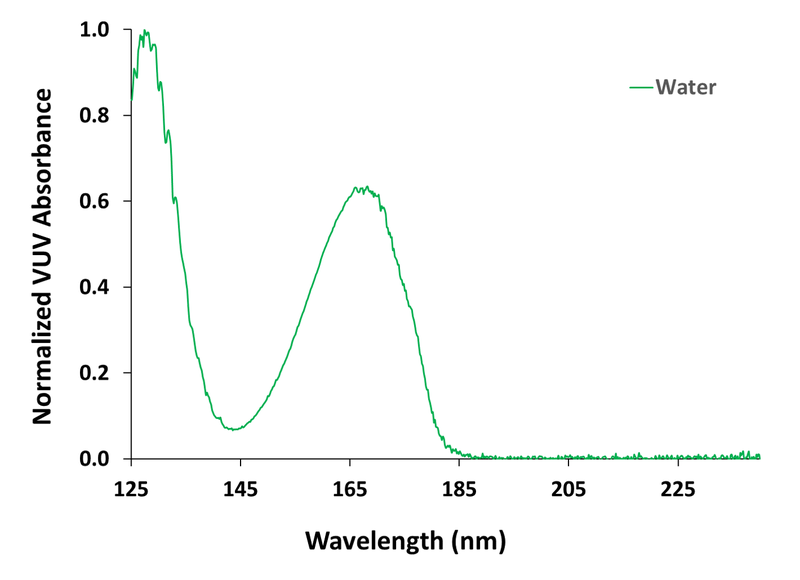 GC-VUV offers a way to determine water without the reagents and problems associated with KF based on water’s unique absorbance spectrum (Figure 2). Previously published work showed how the use of a WatercolTM 1900 capillary GC column, an ionic liquid column that has unique retention for water, allowed the VUV quantification of trace and bulk water in a variety of solvents, including cyclohexanone . Another way to chromatograph water in GC-VUV is to use a thick-film, non-polar dimethylpolysiloxane GC column, which elutes the water first, essentially as an almost-unretained peak (Figure 3). This setup is preferential in some cases to keep the bulk solvent peak from “tailing” into the water, especially when water is at very low levels. 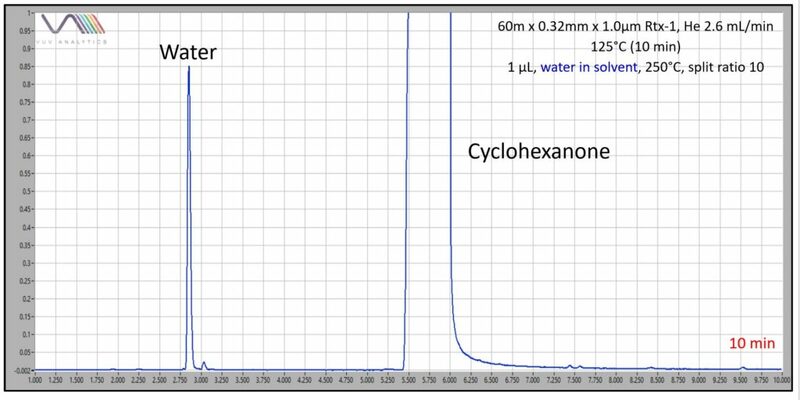 Figure 4 shows a calibration curve for water in cyclohexanone spanning 0.05 to 2 g / 100 mL. The curve shows good linearity, not surprising given that Beer-Lambert law is what defines the response characteristic for the VGA-100 detector used for the work. Background water (not detection) can limit trace-level water determinations (Figure 5), so adherence to the sample preparation and handling protocols established in  will extend the limit of quantification even lower. The method can easily be adapted to other ketone solvents, including methyl ethyl ketone (Figures 6 and 7). Lindsey Shear, Gas Chromatography – Vacuum Ultraviolet Absorbance Spectroscopy for the Quantitative Determination of Trace and Bulk Water in Organic Solvents, The Column (Volume 13, Issue 2, pp 9-13). Figure 1. Cyclohexanone can react with the methanol used in Karl Fischer titrations to form the dimethyl ketal and water, which then gives inaccurate results for water quantification. Figure 2. 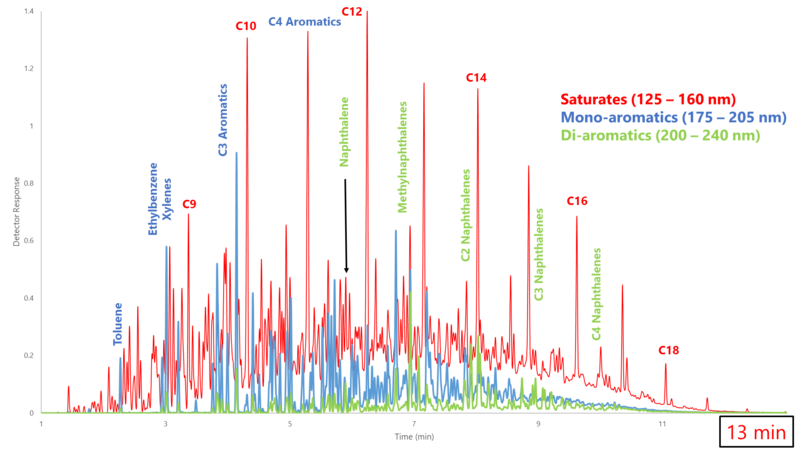 The universal nature of VUV spectroscopy allows the sensitive determination of water in samples when most detectors have either no response or a poor response. Figure 3. Determination of water in ketones can be done using GC-VUV. A non-polar GC column elutes water very early as a sharp peak well away from the cyclohexanone. Figure 4. 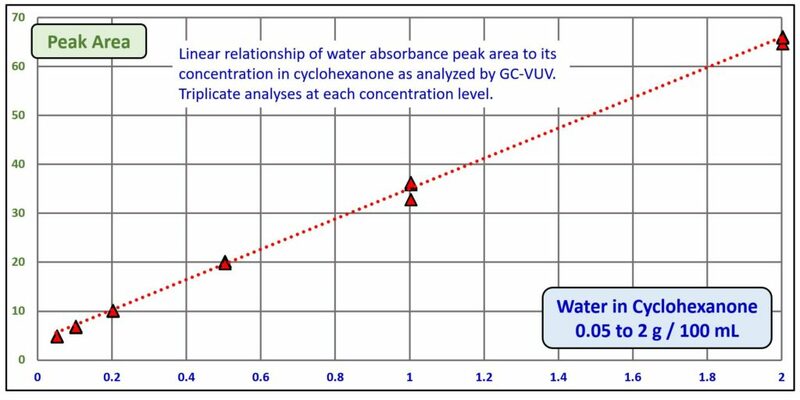 Water can be quantified in ketones (e.g., cyclohexanone) using a calibration curve prepared from the GC-VUV analysis of standards of water in solvent. Figure 5. The red peak is water in the “blank” cyclohexanone that was used to prepare the standards for the calibration in Figure 3. Figure 6. A non-polar GC column elutes water very early as a sharp peak well resolved from the methyl ethyl ketone solvent. Figure 7. 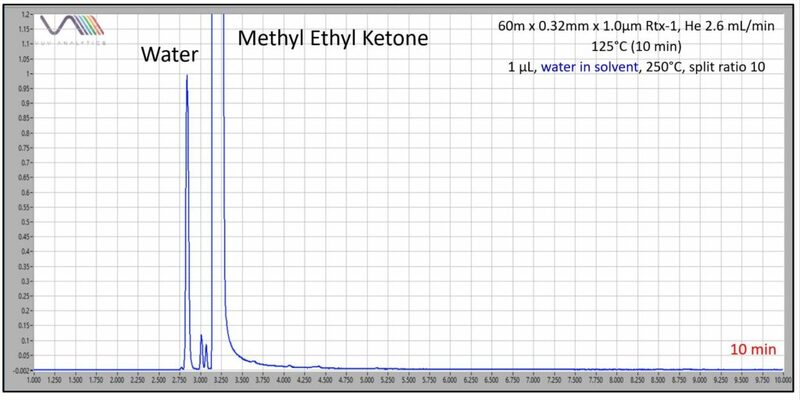 Water can be quantified in ketones (e.g., methyl ethyl ketone) using a calibration curve prepared from the GC-VUV analysis of standards of water in solvent.